Leather is an amazing material. It's soft, yet durable and requires little in the way of care and attention. Leather craft is a timeless tradition, stretching back hundreds of years. Ages ago, custom leather goods were highly valued and expensive. Today, while leather goods are still treasured and appreciated, they don't have to cost a king's ransom. Handmade leather items will last for years and cost a fraction of their store bought counterparts. 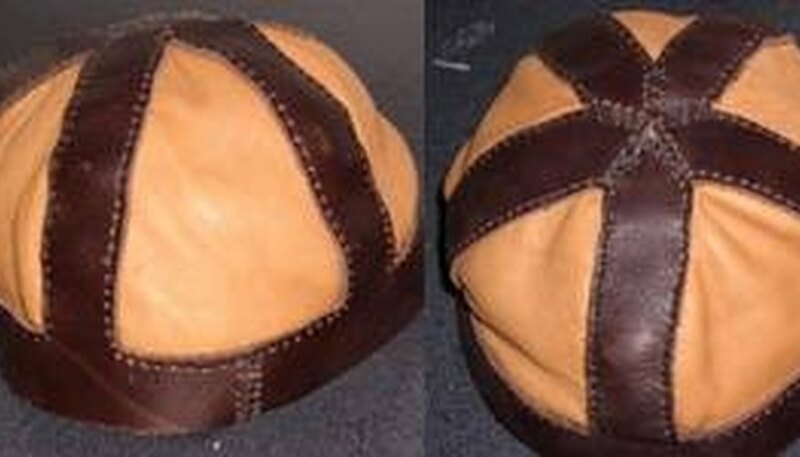 This leather hat is a welcome addition to any sort of medieval costume and serves as a nice jumping off point for alteration and creation of your own design. Wrap the measuring tape around your head to get the circumference. Cut the cowhide. First, measure a strip the circumference of your head, one inch wide. This will form the headband. To find the distance of the five stripes, divide the circumference by five. Measure the headband and make five evenly spaced tick marks. Then, use a one-inch measure to center each tick mark and note the beginning of each one-inch-wide strip. Cut the leather following the pencil guidelines. Take the cut leather and wrap it around your head, holding it in the back. Place the straps on the top of your head. Using a pen, mark each strap where it hits the crown of your head. Trim the stripes so that each one is pointed in the center. Measure 1/8" from the edge of the leather on all the inside edges. Run over the edges with the overstitch wheel. Punch holes where all the marks are made, keeping the hole punch set on the smallest setting. Then, punch holes in the ends of the headband portion where the pieces will be joined at the back of your head. Holding the band together, measure the size of triangles you will need to cut from the deerskin. Once measured, mark with a pencil and cut five triangles. Glue the deerskin in place. Using the stitching awl and the holes you punched earlier, go around the edges of each triangle, attaching each piece of deerskin separately and avoiding any places where cowhide needs to be sewn to cowhide. Using the loop stitch sew the back of the hat together with the leather lace. Your hat can easily be altered by adding flaps or brims to suit you. When cutting leather, always err on the side of caution. Cut it bigger than you need it. You can trim it up later.